Many of these app developers are asking domestic violence and sexual violence programs to partner with them and are encouraging programs to have survivors download the app. While we’ll have reviews of some of these apps available soon in our App Safety Center, here are some things to think about when considering whether these apps are right for you. Currently, the emergency 911 system in the United States is complex. How your call gets routed to 911 depends on whether you’re calling from a landline or a cellphone. Generally, a landline number is connected to the house that number is registered, making it fairly easy for emergency responders to locate you. Calls from cellphones don’t have a set location. Instead, the 911 system uses the cell towers your phone is connecting from to identify your location. Your location can be fairly accurate or not very accurate at all, depending on how far you are from cell towers or how well your phone is communicating with the towers. This is especially problematic for callers from rural areas. Another problem with the current 911 system is that if someone can’t speak, she or he can't explain what is happening when calling 911, a system that generally requires the caller to explain to the emergency dispatcher what is going on. Some of the apps try to overcome these limitations. How Connected Are They to the Real 911 System? These apps are not part of the traditional 911 system. They are a third party that promises to connect you to 911. When you use the app, it connects to you a call center, where an operator asks you questions or interacts with you via the app. After that, it routes you to the nearest 911 dispatch center where you (or the app call center) speak to an actual emergency dispatcher, who then has the authority to send emergency responders. If you were unable to speak or communicate or if you hung up, the app service may call you back and, depending on their policy, may inform your local 911 emergency dispatch center that you called. However that is not very different from how 911 currently works. When in an emergency, there should be as few delays as possible between your call and the emergency responder. It is really important to consider all your options in contacting 911 so that you get the quickest and most efficient response. These apps are very new. They have not been tested to see how many times they are successful in connecting callers to emergency dispatch centers compared to their rates of failure. If you live in an area where, after calling 911, emergency responders were unable to locate you or unable to communicate with you, then these apps might be an option. However, if calling 911 currently works just fine for you, then consider if you need another app that does what you can currently do by dialing 911 from your phone. If you do choose to use one of these apps, test it. Make sure that it works the way you want it to. Don’t wait until you’re in an emergency to realize that it doesn’t work. In our tests of some of these apps, we found that when we used the texting option, although we received messages from the app saying “help is on the way” and that 911 would be contacting us soon, no calls or assistance came. We suspected that this might be the case, since most 911 call centers are not equipped to respond to text messages so we knew that this was unlikely to work. But Don’t These Apps Have More Features than the Current 911 System? Some of these apps have additional features that you may find useful and helpful to you. If you test it, and it works the way it should, and you want an app that offers these features, then go ahead and use it. However, there are a few things to consider about some of these features. A lot of these apps promise to determine your location better and more accurately than the current 911 system. While this may be true in some circumstances, it may not be true a hundred percent of the time. Your cellphone location is accessible in a variety of ways. If your phone is dead or you are in an area with very poor or no signal, there is no guarantee that these apps will do a better job at locating you. A final concern is how “evidence” from these apps (which can be in the form of recorded audio or video) will hold up in court. Generally, 911 calls are used as evidence in criminal cases, but if you are using an app where your first emergency contact was with a third-party company, how that interaction will submitted in court is unknown. Talk to local authorities about how this type of evidence could be used. Ask the app service how accessible the “evidence” will be. Some companies may release the evidence only with consent from you, and some companies may release it to anyone with a proper legal order, which might include the abusive person and his or her attorney. Should I Download a 911 Alternative or Enhancement App? Many of these apps are being marketed specifically to domestic violence and sexual assault victims because they know that survivors’ ability to connect with 911 is critical. If you want the ability to make a silent call to 911, or want a service that will communicate to someone your location, name, and any other personal information you choose to share, one of these apps may give you peace of mind. However, don’t trust your safety to an app without learning all that you can about it and testing it. It might be faster to call 911 from your phone. Most smartphones have an emergency feature that allows you to call 911 with a swipe and a tap, even if your phone is locked. 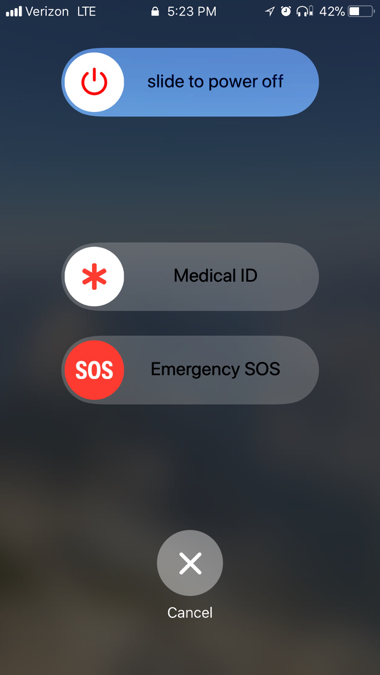 If the app requires you to unlock your phone, find the app, open it, and then do whatever is needed to send the emergency call (tapping a button 3 times, or push a button and then confirm or cancel the call 3-5 seconds later), it might be faster to just dial 9-1-1 during a serious emergency. Assess whether you have a situation in which using these apps will enhance your experience when calling 911. For example, you may live in an area where emergency responder has had a difficult time locating where you are, but after testing one of these apps, it does a better job. If the app contacts other people (in addition to emergency dispatch centers) and shares with them that you are in an emergency, talk to the people you chose for the app service to contact and let them know that they may be contacted and what they should do. Have a backup plan and trust your instincts. Don’t rely entirely on these apps. If you are in an emergency and something doesn’t feel right, trust your instinct and do what is right for you.